While driving through the hills of eastern Tennessee in 1934, a small cadre of friends became engaged and then embroiled in an animated conversation about the steps necessary to protect the limited wildlands remaining in the United States. That conversation gave birth to The Wilderness Society, which led decades later to the passage of the Wilderness Act. That group of friends and colleagues represented a cross section of public and private professionals: Harvey Broome, a lawyer and passionate conservationist from Knoxville, Tennessee was in the car with three federal employees – Bob Marshall and Bernard Frank from the United States Forest Service (USFS) and Benton MacKaye, then of the Tennessee Valley Authority, passionate advocates for the preservation of all things wild. Their views represented perspectives from both inside and outside of the federal land management prism, but these views shared enough in common to buttress the future of the National Wilderness Preservation System. Since that fortuitous car ride, service to the idea of, and stewardship for, wilderness has come from deeply committed individuals whether they hold an agency position, a role in professional conservation, or are just someone with an inspired commitment to volunteerism. 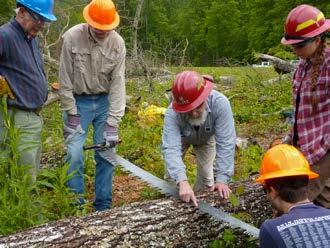 This article examines the partnership between the Southern Appalachian Wilderness Stewards (SAWS) and the Southern Region of the USFS. It describes the creation of this partnership and documents several keys to its ongoing success. Overall, it shows that a shared vision and shared commitment to wilderness between agency professionals and private sector partners is alive and well. A popular commercial offers an amusing way to think about the words we use in the partnership community. The scene starts with two people sitting in a waiting room. One turns to the other and says, “Did you know 15 minutes can save you 15% or more on car insurance?” The other says exasperatedly: “Everybody knows that. But did you know words really can hurt?” The scene then switches to a western movie parody. A lone man is riding off into the sunset. The words The End descend through the hazy technicolor sunset and downward as the man rides on, dust kicking from his horse’s hooves. Not a second later, the rider is literally knocked from the saddle and onto the ground by the physical presence of the letters on the scene. The viewer is left to snicker at the absurdity of the word’s actual presence on the horizon causing the rider to fall and hurt himself. Partnering would be so much easier if potentially hurtful words took physical form and knocked us in the head. But they don’t. Instead, words of our organizations’ leaders are constantly, but subtly, interpreted by all who hear them. Eventually a collective interpretation emerges that, whether accurate or not, and whether conscious or not, forms an understanding of the leader’s intent and point of view. This understanding, in turn, affects staff interactions with each other and with the outside world. The interpretations become self-reinforcing, weaving themselves into organizational culture and affecting the lens through which all opportunities are viewed. When repeated enough, even the most innocent, but slightly off-kilter words can result in a challenging organizational culture. In the partnership world, a challenging organizational culture can knock down a good idea or initiative faster than even the worst rider can be thrown from a horse. The US Forest Service strives to build a culture that embraces the talents and contributions of all people, both inside and outside the federal agency. The agency acknowledges that conservation is difficult, challenging, and complicated. Success depends on the full complement of vested stakeholders acting together. People and organizations from all walks of life, not just agency employees, are needed to care for wilderness and protected areas and to actively steward their future. “We use partners and volunteers to the fullest extent possible” almost doesn’t need translation. Really, who wants to be used? Thankfully, despite being spoken quite frequently, the intent behind these agency sayings is not anywhere close to the potential translations. Nonetheless, to keep them from resulting in an unintentional culture that hurts our partnership aspirations, we must learn and change quickly. 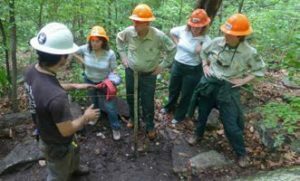 The language used by the Southern Region of the Forest Service and the Southern Appalachian Wilderness Stewards provides a good example of an alternative way to describe partner-ship that empowers collaboration and respect. The article sections following, written by practitioners in that partnership, offer a way forward. Launched as a response to concerns from recreation interests to proposed wilderness acres being added to the Cherokee National Forest in Tennessee, SAWS began operations in service to stewardship needs across 22 designated wilderness areas on the Cherokee National Forest, the Chattahoochee-Oconee National Forest in Georgia, the Nantahala and Pisgah National Forests in North Carolina, and the Francis Marion-Sumter National Forests in South Carolina. Since the launch of SAWS, the approach of the organization has been to provide capacity for stewardship activities within wilderness areas. SAWS’ purpose is to work with federal land management agency professionals, not to just show up to work on national forest lands. That difference may sound subtle, but it is far from just a play on words. Work can be produced in a “working on” manner, but that approach leaves opportunities on the table. The idea of just “working on” a forest or in a protected area can still produce positive outcomes, but many times those outcomes fall short of realized potential. For SAWS, the “work with” model is one that goes beyond creating or replacing capacity for the agency. It is not a vehicle to insert different decision makers into processes reserved for those charged with caring for the common good; rather, the “working with” model provides the context of a partnership that considers what the work may be, why the work is proposed, and how the decisions are examined and made. To work with a partner is to start the relationship from a shared values perspective. Identifying and defining those shared values can uncover unique propositions and can prevent future conflicts or misunderstandings. The model of one partner (agency) defining the work, while another (NGO partner) accomplishes the project misses the opportunity to develop creative solutions and holistic approaches for stewarding resources with a scaled growth of capacity. As a working partnership, now stewarding 45 wilderness areas (the George Washington-Jefferson National Forests in the Virginia were added to the SAWS footprint in 2013), SAWS and the USFS maintain formal and informal lines of communication to consistently define shared expectations and opportunities (Figure 1). Defining shared values requires understanding what wilderness values and interests are priorities for the agency and regional staff, and how those values and areas of focus align with the organizational values of SAWS. It is an ongoing process to define and refine shared interests and a shared vision. Figure 1 – SAWS and USFS partners working in the field. Photo by Bill Hodge. For application outside national forest lands, the SAWS approach is to be engaged beyond instances when stewardship needs are scoped. It is to be involved when needs are identified. This is reflected by collaborations to identify restoration or relocation needs associated with recreation impacts. It is more than completing the trail or campsite work but instead being part of designing data dictionaries and understanding how data could be used to mitigate other impacts to wilderness character. These are concrete examples of working with an agency as opposed to just working for the agency. These approaches provide knowledge trans-fer and allow organizations to grow into new and needed capacity areas beyond trail crews and seasonal positions. As a partner’s knowledge base grows, so does the agency’s confidence in the partner to bring forward ideas and solutions to issues and challenges within the National Wilderness Preservation System. The Wilderness Skills Institute (WSI) is a prime example of a partnership between the US Forest Service, the Southern Appalachian Wilderness Stewards, and Appalachian Trail Conservancy. The WSI is a two-week, intensive training collaborative that is attended by agency employees, volunteers, employees of nonprofit organizations, private business interests, and individuals with a desire to contribute their talents to the preservation and protection of southern US wilderness areas. Over the course of two weeks, as many as 100 participants develop and hone skills needed to steward wilderness areas. Participants examine what federal wilderness designation means, and the important values associated with wilderness areas. They train to become adept in wilderness first aid, in safe crosscut saw use, trail maintenance and construction, and in best practices for communicating with visitors in a wilderness environment (Figure 2). Some participants develop more advanced skills related to managing visitor use, crosscut saw instruction, or how to prepare a Minimum Requirements Decision Guide within a wilderness decision-making process. These skills and the associated knowledge are then intended to be directed toward on-the-ground stewardship in the future. Figure 2 – Training in traditional crosscut saw use. Photo by Bill Hodge. Although similar trainings occur in other parts of the country, and across the globe in protected areas, the Wilderness Skills Institute is unique in several ways. The institute’s partners have a shared vision of “fostering through skills development an engaged, informed, invested stewardship constituency for wilderness.” This shared vision and partnership has allowed the WSI to take on a life of its own and become rooted in the culture of the wilderness community. Modeled on the Authority of the Resource Technique (ART) (Wal-lace 1990) of communicating with wilderness visitors, the WSI training is rooted in a sense of shared responsibility for the wilderness resource. There is a strong emphasis on “shoulder to shoulder” planning and learning. Every year the planning team, composed of individuals from all three entities, starts the conversation together on what is to be offered at the WSI. The words shoulder to shoulder, used to talk about WSI, are infectious and energizing. The term is used to describe the coming together of equals in a partnership that delivers benefit to all. People brag that when WSI is in session, you can’t tell who works for whom, or who is getting a paycheck, and who is volunteering. All are there for the love of the wilderness resource, and all contributions and ideas are valued equally. You hear it in the words they speak to each other (Figure 3). Figure 3 – Wilderness Skills Institute participants. Photo by Bill Hodge. The results of this training have included stronger relationships among partners, growth opportunities for attendees, skills strengthening within the wilderness workforce, and a strong sense of community in sup-port of the wilderness resource. This model of using ART and the language of working “shoulder to shoulder” to build wilderness partnerships can be replicated. We have a resource to focus on – the wilderness. Utilizing the “shoulder to shoulder” approach to partnership allows us to remain focused on that resource. Through this we can learn, build skills, and improve wilderness stewardship together. The conversation between federal and private conservationists that began in the hills of Tennessee so many years ago is indeed alive and well. For both SAWS and the Forest Service, the conversation and the partnership it engenders is a critical part of the work we do. Neither organization sees or speaks of the other as simply a means to an end. We partner because the individuals who value wilderness and wild places have a fundamental right to participate in their management, and the participation of the people makes wilderness stronger and more resilient. SAWS does not work on national forests. SAWS works with the Forest Service to strengthen the positive impact of both organizations on the land. The Forest Service doesn’t use SAWS because it can’t get the work done without them. The Forest Service works shoulder to shoulder with SAWS to figure out the best work to do and accomplish it. This language is powerful. It leads to a partnership culture that inspires, empowers, and uplifts. Together and with welcoming arms for others we buttress the future of southern Appalachian wilderness. BILL HODGE is the executive director of Southern Appalachian Wilderness Stewards and chairman of the National Wilderness Stewardship Alliance; email: billhodge@trailcrews.org. JIMMY GAUDRY works for the US Forest Service as the wilderness program manager of the Northern Region. Previously he held the same position in the Southern Region; email: jcgaudry@ fs.fed.us. MICHELLE MITCHELL is manager of the US Forest Service Southern Region’s Partnership, Volunteer & Service Programs; email: michellemitchellfs. fed.us. Wallace, G. N. 1990. Using the authority of the resource as an interpretive technique. Legacy 1(2): 4–9.